Let’s talk about Steve Jobs, Freedom, and how an official from Cuban Intelligence can’t turn off an iPod. Like the Cuban language itself (impossible), like the poverty into which the imagination here has fallen, like the remains of the island culture (fortunately now Balkanized without origins or teleologies of chastity), like our insulting ignorance of the civil, like our infantilized institutions (rudeness as one of the fine arts and despotism as a measure of all things), like our pedestrian diplomacy and our governance of the stick (sticks), like Cuba itself, the State Intelligence of this forever lost country did not have to be the exception: the political police can not think well and, in consequence, act much worse. The repression of ridicule. Let’s not get into State statistics — hundreds of cases in a few hours — that State style that while more informed with data means less significance can be shown. Let’s not get into the customary whining about you-violated-my-rights and I’m-going-to-denounce-it-internationally. Let’s not get into the biography of two Cubans who want a little more, now that they shared a hunger and thirst strike for two days in the extra-judicial jail cell, hunted like vermin at 3rd and 30th, in Miramar, handcuffed at full speed by the Geely 801 of State Security, until spit out at the Regla Police Station (some day China will have to compensate the Cuban people for the damage caused by these vehicles). Let’s not get into anything. Let’s run the memory in its absolute and desperate freedom. I never heard shouts of “Down with Fidel.” Surely it’s a little late to topple this name in the past perfect, but nor did I hear anyone shout “Down with Raul.” Pastor, Emilio and Judit, three of the ex-occupants of the Church of La Caridad on March 13, undertook to hammer those screams from one end of the neighborhood to the other, shattering the solemnity of death of the thousand and one uniforms of I don’t know how many colors that swarmed there. They’d crossed half of Havana to get there, to find out about the old activist Corzo, but were ipso facto detained for a crime against solidarity. The station was converted into a barracks. it was obvious they were expecting military intervention (or perhaps Cuban planned one against the enemy government of the region). They didn’t beat me (my right hand is typing still numbed by some handcuffs placed not to immobilize me to cause damage to my blood circulation: I didn’t confess it then, but it did work). I have a deal pending with one of those who kidnapped and beat Yoani Sanchez on 9 November 2009. 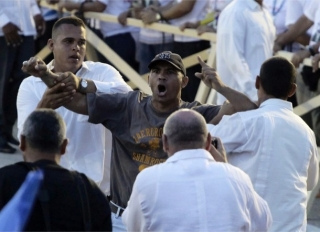 An overwhelming man who tried to force us toward the hospital, according to him evidence that there was no damage (as if to exist in Cuba knowing that he remains on the loose not having committed was not already enough damage). I gave my word (my word as a lying mercenary, as he graciously called me in front of his subordinated with his gray atlas complexion). He’s here now. They didn’t hit me. In fact, beyond the swagger of a Station Chief who perhaps took advantage of the incident for a promotion, I felt protected by a National Revolutionary Police (PNR) who confessed to me they had nothing to do with it, they themselves were captives of a higher official. What that does not make them, of course, is less complicit or less violators of the police code. They never allowed me to make a phone call or to advise anyone. So I had to shout, through the free half-inch clearance between the boarded up bars, to see if some passerby would take my phone number and address. Most walked on, I guess. But more than one noble Cuban man or woman called. Thank you. Thank you from my heart. Someone should do that in all the prisons of the Island and the world: walk by the bars to listen and spread the cries of the disconsolate. THEY DID NOT BEAT ME. Friday, November 6, 2009 is history. Do not hit me, anonymous official, you know everything about me and have even protected me from the Islamic fundamentalist who were targeting @OLPL with their Tweets about the criminality that flows from the Koran (like the Bible and all sacred books). DO NOT HIT ME. The open question is: Was such a mafioso act of atrocity probable? What God will protect me from the earthly wrath of State Security? What Pope on the front page with the General President or what Cardinal to whom that too large an office is left (there is only one step in the ineptitude of the heresy)? I was imprisoned. For the first time in my life and without charges. I did not see nor will ever see, the Holy Mass that the Pope simulated simultaneously in the Plaza of the Revolution. A mass of materialistic marionettes trained to chant in Latin. Speaking with the people at street level (and renting a State SEPSA van as a taxi), I knew that the three cordons of coordinated public or in the Ministry of Interior gang (a ministry that increasingly guards its ministers badly). And of the hundreds of workplaces called to coagulate the railed cubicles of the expanse (no posters, please). And the traffic sequestered more than 24 hours in advance. And the compulsory collection of beggars and dissidents, this wonderful mix. Still shining from those below not know why I always fill myself with a hopeful illusion. I did not have, nor do I have yet, mobile phones or home. The slow dial-up official Internet also vanished as if by magic (the Three Evil Kings: freedom of movement, freedom of information, freedom of expression). That little game of they-are-orders-from-above and who-pays-orders is technically a criminal irresponsibility (such as the PNR) and some day there will have to be compensation from ETECSA and CUBACEL to their respective users, cheated from above even the official contract. I do not believe in God, but despite the absence of the divine, Good sometimes manages to inhabit Man. It’s hard to be yourself and be along and above not to have the Evil of pure fear and hatred of reality (of ourselves, a unique feature of the biosphere). I don’t believe in God but I do believe, for example, in the excommunication of the Cuban cardinal who enrolled (and muddied) his Holiness Benedict XVI in a foretold Vatican shame, such as the only two Masses of little lies in the history of mankind. The Guinness Book of World Records threatens to be the posthumous blog of the Revolution. The apostolic retractions and little notes halfway to the Nunciatures will be of little use now. We children of Cuba are living a black day due to the presence of this success of Peter, perhaps his superior attributes already weigh more than they’re worth. His word was elsewhere. Not here and now. And it makes sense being an institution doomed to the hyper-realistic myth of transcendence. I never knew my body could be fine without water and without food for so many (and so few) hours. From cell to cell I asked Silvia in signs who would not insist. By signs she let me know that her situation was much more insulting: a License to practice dentistry without any kind of militancy or activism (except teaching), she was imprisoned by mistake, for love, out of horror. Silvia was hiding her tears, but not her contempt for the officers (meanwhile more intimidating, more outrageous). I felt nothing but infinite sympathy. Eventually we started to talk out loud from cell to cell. We gained courage. We remembered a prison clip from the reggaeton “Patry White The Dictator,” a super woman we both like. We agreed on what to do and to remain silent if they separated us. I asked her what she wanted for the next day. We lamented our baby cats, locked in the house in a state of involuntary starvation. She encouraged me with her sketches of the life of Steve Jobs and asked me to take her to live in a giant Mac, a planet of silver and free creativity. I told her how humiliating it was to see our digital objects manhandled with this primitive curiosity, a primate, a violator who doesn’t understand the intimate logic of personal property (shamelessly exposing for the first time in decades the vegetable viscera of my godfather’s charm from my childhood). I assumed they were copying our house keys (or they were using them to conduct an illegal search in our absence, as well as to intimidate her). Silvia told me that Cuba was a sick country because no one like Steve Jobs was born here (or could fit here). 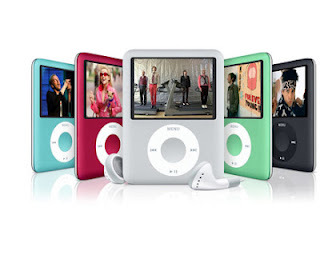 I told her our taken iPod had run down because those who took it couldn’t find the OFF switch (they tried to get me to instruct them but I shut up out of revenge). They were obviously analog minded repressors, anachronistic, in any case users of the more commercial Windows. Purely to shock my captors and compañeros I ended up singing, with the tenor echo of the catacombs (“MediastinumLumberjack,” an Eduardo del Llano mockery of me), gradually losing my timidity of the complacent inmate, fine tuning a Catholic fashion theme about this little doll to whom all your children / we cry to you / Mambisa Virgin / who are you brothers. And then songs in English from some animated feature films, including the classic Voltus V. As Papa Lorenzo would say in “El Juego de la Viola,” these people really like cartoons… Our tragedy will be weightless, our destiny a cartoon. They told us we were under “investigation” for a “public scandal” in the future tense or perhaps in the subjunctive mode (verb tenses are not the forte of those in uniform). We passed from the jigsaw puzzle of “occupation” of our possessions that would be and, in fact, were fastidiously returned to us to the last cable and the next ticket (it was all Silvia’s, nothing of mine, including packets of milk powder with a “receiving” stench). They tried a police line up en masse which we resisted (and locked against the bars the three ex-occupants of the Cuban Republican Party). We never signed anything, we never wanted to admit that they’d violated us abducting us there (disappeared, that’s the word, because the Power is not worried about any family angst blindly calling on the medical corps on duty). Only with the lifting of the landing gear did we once again recover our freedom, that unspeakable gift. I implore the world not to schedule any great event in Cuba. I pray that nothing significant happen in this country again, please. One day they will they will kill us like they couldn’t help it: the chain of command is that lazy (and innocent). I guarantee the list of victims is already written, I can almost read one of its pages in the moving hands of an officer. I swear by my faith in Man that the staff to carry it out is guaranteed: I saw them throughout this long and sleepless night of shadows, with almost no children (or angels). There will be no Plaza of the Tahrirevolution in Cuba. The exile is already further off than usual. The digital telephone is just that: digits in a cloud that retains a highly visible OFF switch. Not even the most incompetent of the Counter-Intelligence Cubans could miss it. One click and the Holocaust will click in behind closed doors, like in the pre-Internet 1970s. This button, reminiscent of the Cold War Red Button, is perhaps a programmed keyboard from the Era of Eliecer at the University of Information Sciences, this little tap of bits will unleash the barbarianism of excess in Cuba, enough to erase the genealogy of a civil society at the margin of the totalitarian idyll that mutates here and kills without symptoms of extinction. In Kuba werden kritische Stimmen im Netz lauter und mutiger. Das Beispiel einer Video-Plattform zeigt aber auch, wie das Regime reagiert, wenn es offen kritisiert wird. Trotz aller Widrigkeiten bleibt Rodiles kämpferisch: “Dass sich etwas ändert, lässt sich nicht aufhalten. Kuba sei wie ein treibendes Schiff, mit ungewissem Kurs. Orlando L. Pardo, einer der aktivsten Blogger der Insel, ist da eher pessimistisch: “Nichts hat sich verändert. Laut Verfassung gilt das Recht auf Meinungsfreiheit nur, wenn es im Interesse der sozialistischen Gesellschaft ist. Regimekritik wie die von Rodiles ist der kommunistischen Partei ein Dorn im Auge. 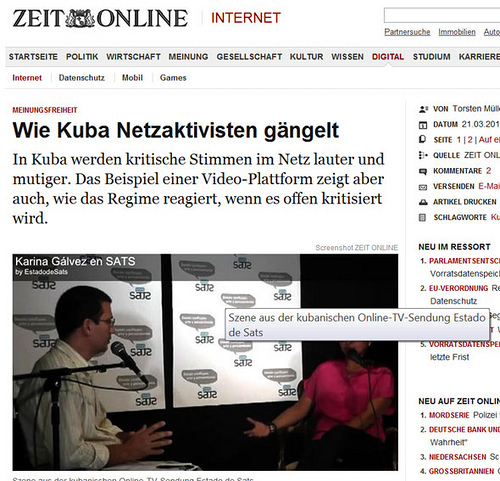 Nicht umsonst gilt Kuba der Organisation Reporter ohne Grenzen als einer von zwölf “Feinden des Internets”. “Klar, dank des Internets gibt es jetzt weltweit Sympathisanten”, sagt Pardo, “doch hier auf der Insel hat das Projekt keinerlei rechtliche Grundlage. Translator’s note: I will let you paste it into Google Translator yourself! I have “some” German but I wouldn’t want to overstep myself! The reason for this letter is an event that happened on March 6, 2012, Year 53 of the Revolution; an event which from our perception as novice… and not so novice filmmakers, is an unusual event. At this news we immediately called on our logical reasoning: Why can not our film be shown after accepted for the Young Filmmakers Exhibition? How far outside of the artistic or political Cuban culture is it? What is the Cuban cultural policy? As a second step we met with Fernando Perez, an exceptional director in Cuban cinema and president of the Young Filmmaker’s Exhibition. In the conversation with Fernando, he told us that he had decided to resign from his post as President, maintaining that support but taking that unfortunate decision. Fernando Perez with his team, in selection meetings, approved Awakening; but this was not valid for X culture officials, who told Fernando that Awakening was out of competition; obviously, this information was not shared by compañero Roberto Smith. 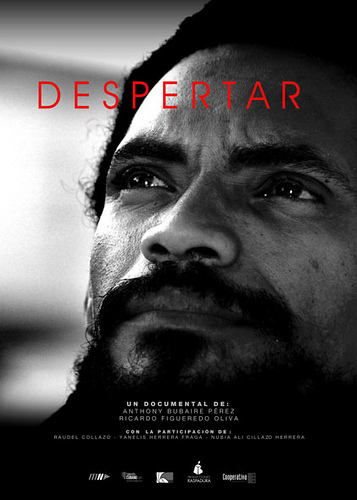 What compañero Roberto told us is that, after the film was chosen for the competition, there was “a review” by the board of ICAIC, where they determined, “among other things” that for “a question of production” it could not be submitted. We question all of this. Does it still exist? If this ploy is part of the cultural policy of the country, then consider that we are devolving emotionally, or realigning ourselves in underdevelopment. If we are heading down the path of social development, if the economic projects are maturing, and if compared to the world situation we are in a “period of proliferation,” those mentalities and projections are inversely proportional to the policy exposed up to them. Are we really changing. Rectifying the errors? Events of this type, are they errors or solutions? In previous decades, were we wrong, or “were we wrong”? From our position, the hoop is smaller, which makes us think that our “case” as not been the only one in recent years, so of course it’s to be expected that we are very concerned. We must exercise a strong criticism against events like these. If the institutions and the officials of the institutions continue to act in this way, Cuban art, which is manifested in the streets, which emerges from reality, is going to go under one of these days. Will Cuban art be elitist? Or will the “art of the people” be elitist? What is the “art of the people”? Every day I see different manifestations of Cuban art displayed in the mass media and most of it does not represent us, it does not show the true reality. Is that valid? What, then, does it represent? Who does it represent? Is this the image? Festivals of culture, films, theater, music happen; but what “artists” are included there? If the process of selection and “revision” are similar to what happened with my work, what is on display: art or propaganda? It is peculiar how the are “within the Revolution” has experienced several interesting processes; those meetings at the National Library or “The Words to the Intellectuals”; the First Congress on Education and Culture, the Padilla case, the “Five Grey Years” or Pavonato; and many others; in most or in every one of them huge errors were committed, irreparable errors for art and culture in general, errors that perhaps affect the actions of many artists, errors to which today not a word is addressed because they are surpassed, errors that are now exposed as mechanisms for disposal. We see, if these processes are taking as guiding examples for the direction of Cuban art today, we would like to emphasize, then, that we are marching in a different direction contrary to progress, and that every day will further strengthen the executors who don’t hesitate to censor, not as a function of a sovereign culture, but as a function of growing as an Inquisitor power; becoming in this way, as in former years, the Cuban culture in a State beset by irrational arrogance, insensitive and unreasonable. To limit this disagreeable immediate future we wish that ICAIC would offer us an explanation for the event discussed here, or perhaps an apology, a reappraisal; naturally we would not want obsolete justifications; there are many people affected by this and there has been so much sacrifice in every image; therefore, I make a call on the good judgment of some people, in whom we still have hope. A CROWDFUNDING PROJECT – SUPPORT RAUDEL NOW! FINANCING COLLECTIVE FOR THE FREEDOM OF CUBA. to be a bridge between free Cubans on and off our little island. CLICK ON THE PICTURE BELOW TO DO YOUR SHARE!!!! I did not want to overlook a significant event that occurred a few days ago. While we were participating in the successful Film Critique Workshop, Fernando Perez quit his job as the director of the Young Filmmakers Exhibition, an even that, thanks to its vision and what it delivers has become an irreplaceable audiovisual reference point on the Island. Reading your blog, its text THE HIGGS PARTICLE, with the echoes of our recent debates about the cinema of the ‘70s fresh in my mind and encouraged by the workshop, I have to express my complete support for Fernando who, once again, has shown his ethics as an artist and as a Cuban. 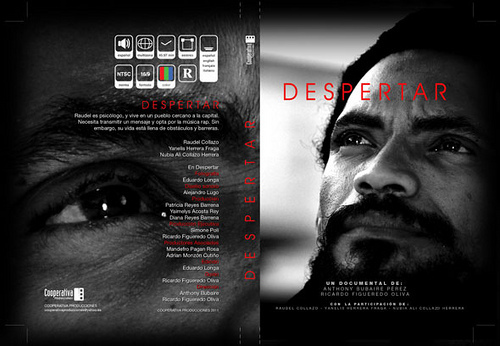 At the same time, I can’t but be alarmed by the silence of so many filmmakers, young and veterans, with regards to it. Over ten years ago, in a text published in Revolution and Culture, titled Noises in the Warehouse, I expressed my point of view about the state of audiovisual production in the nation, from the emergence of the new generations and the weakening of the official industry. I said then, that the main problem I saw was this fragmented creation was precisely its weakness as a generation. Everyone seems to be staring at their navel, without really taking sides for the fate of their cinema. For them the important thing was to create, make, film, tell their stories and express themselves without a sense of belonging to anything, with a fidelity to anything outside themselves. A little later, we saw the first symptom of it when Ian Padron saw his documentary Out of Season censored, without any of his contemporaries saying one word about it publicly. The Young Cinema Exhibition itself has seen, year after year, how diverse materials are “uncomfortable” for this apparatus that is faceless and nameless but that prohibits, cuts, limits and silences, works created by the youngest artists. The documentary Revolution was the object of derision, polemics, arguments and dismay two years ago, although the Exhibition managed to show it and even give it a prize, other later Festivals refused to register it under pressure from “on high.” Significant movies like Family Video, the aforementioned Out of Season, and the documentaries Of Divers, Lions and Tankers, The Illusion, Havana Looking For You, Utopia or Revolution, still have not shown in our theaters or on television, in a natural and commercial way. I only mention a few that have won awards and have been considered, by the critics, among the most prominent films made in Cuba in the last decade. When Fernando Perez signs his text and remembers his position as an inclusive project manager, who has for year been a leader against every kind of “external forces,” those who love art and cinema should be at his side, although for them they have to paralyze the Exhibition. Never mind here if the documentary censored now is any good, successful, or mediocre, what matters is the common position the younger creators should take and also for those who are or not, with this attitude that censors and bans. If the ideologues, or the functionaries of ICAIC, believe that a documentary can cause the fall of a system, an idea, a societal project, then little has been achieved over the last 50 years. If a film, however realistic or critical it may be, leads to the bureaucracy or the mediocrity censoring it, worried about the “ideas” expressed in it, it is simply a sign of the total failure of this will and the extraordinary weakness of this political project. If someone can identify the protester, please give his name now. This Cuban person, for a simple shout, is going to suffer tortures and a sentence that could be 10 years or more. Note – Clicking on the image of the Video will take you to Diario de Cuba where you can see the video. Translator’s note: The video is self-explanatory without subtitles. The person being led away and beaten over the head with a beach umbrella shouted “Down with Communism” at the Pope’s Mass in Santiago de Cuba. Every February, the Chaplin Cinema opens its doors to the Young Filmmakers Exhibition organized by the Cuban Institute of Art and Cinematographic Industry (ICAIC). The Exhibition is presented as the only and therefore the best chance for the youngest filmmakers to show their work. Organized under the guidelines that govern the ICAIC, and being that this is a center that, despite enjoying some autonomy, meets the state interests, the Exhibition retains the right whether to accept films according to its policies, which do not serve the interests of the filmmakers. So it can be said that it decides based more on political correctness, than on the quality of the work as artistic and critical means of expression. It is evident that under this right of selection is hidden censorship and exclusion from the system, which the documentary Awakening, directed by Ricardo Figueredo Oliva and Anthony Bubaire did not escape this time. The topic is Raudel Collazo, best known for Escuadron Patriota (Patriot Squadron), who, in the lyrics of his now-censored songs, takes on with strong and direct speech core issues that attack Cuban society, such as racism, fear and segregation. 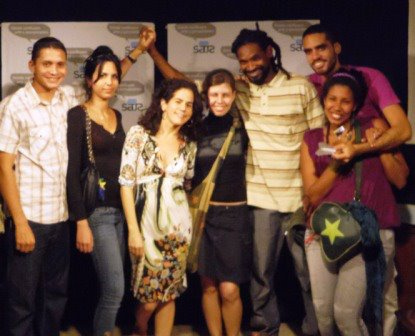 Which brings us back to the show last year when the documentary Revolution, which explores the history of Los Aldeanos (The Villagers), Cuban hip hop’s most successful group on and off the island in recent years, was also censored, only this time as opposed to that, all parties did not reach consensus. The freedom of creation and exhibition is still a conquest to be reached in Cuban audiovisual media, and institutions rusted away by time and their policies, which are obsolete in the current context, look like old dinosaurs today. More than ever, Cuban cinema lives today among the hundreds of filmmakers such as Anthony Bubaire and Ricardo Figueredo who strive to assault and present reality with all its nuances. It is necessary that the ICAIC, an institution that has championed art as a fundamental premise, echo the needs for which Cuban society is avid: the completion of an art that is more than their reality, a cinema that shows them to be more than they are and what can be, and that for once leaves behind those politics that are maintained only in cinema tied to the remnants of a past that only endeavors to reveal the reality of two colors: red and green.